The long-awaited free to play section of Lego Universe just opened its virtual doors, removing all excuses for not playing the creative lil' MMO. Unfamiliar with Lego Universe? Imagine a massively multiplayer realm with the user-friendly interface of World of Warcraft, only instead of that game's now-clichÃ© Tolkienian fantasy tropes, Lego Universe hinges on the idea that players should be able to solve problems by building things with the game's titular blocks. Graphically, it does as good a job replicating the charmingly geometric world of Legos as any of the Lego Star Wars or Lego Harry Potter games, and unlike those various series, Lego Universe is not constrained to a single theme. You'll find ninjas, pirates and dragons in Lego Universe, all without a hint of ironic condescension. "Whimsy" is a good tag word this MMO. Why take my word for it? Assuming you have a modestly powerful PC or Mac, you can now experience the game for yourself, free of charge. The site is being slammed at the moment, but if you're willing to brave the traffic, you can now download the client from the game's official site. As per usual, if you join the free to play version and find yourself hooked, the Lego Group will happily accept $10 per month in exchange for access to the full game. The Lego Universe site offers an exhaustively detailed rundown on everything a full membership entails, but that's getting a bit ahead of ourselves. 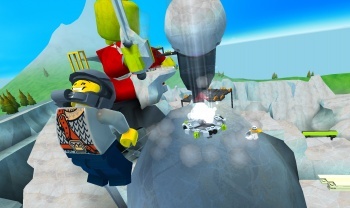 For now, it's enough to say that there are no longer any valid excuses for you to not try Lego Universe. You like Legos, don't you? My brother was in the beta for that game, what I saw of it while he was playing looked fairly amusing. I should give it a try myself, assuming I can drag myself away from Age of Conan (seriously, they hooked me big time with their F2P move there, so bravo FunCom).